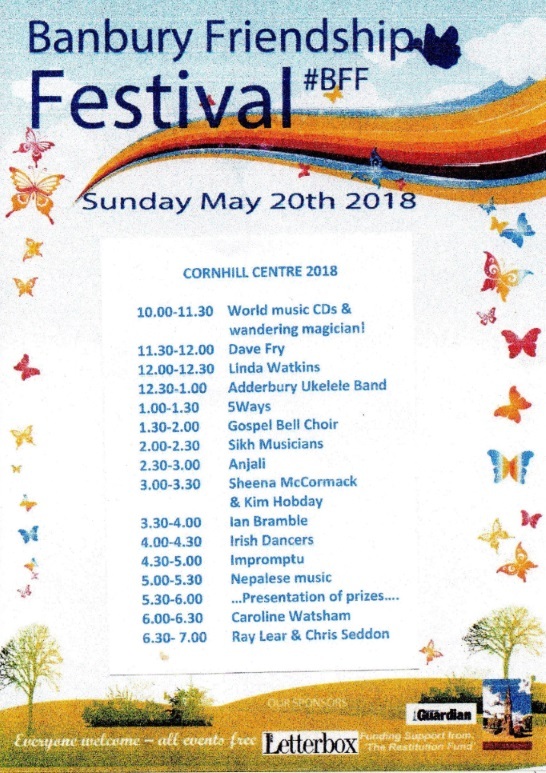 Gospel Bell were delighted to play again for the second consecutive year at the Banbury Friendship Festival – an annual, multi-faith celebration and charity fund-raising event. The day-long activities are free of charge – though donations of more than £300 were raised. This year, proceeds have been divided between three local charities: ‘Let’s Play’, The Sunrise Multicultural Centre and The Sunshine Centre. Thank you so much for coming along on Sunday and singing and playing – the performance in the hall was brilliant! 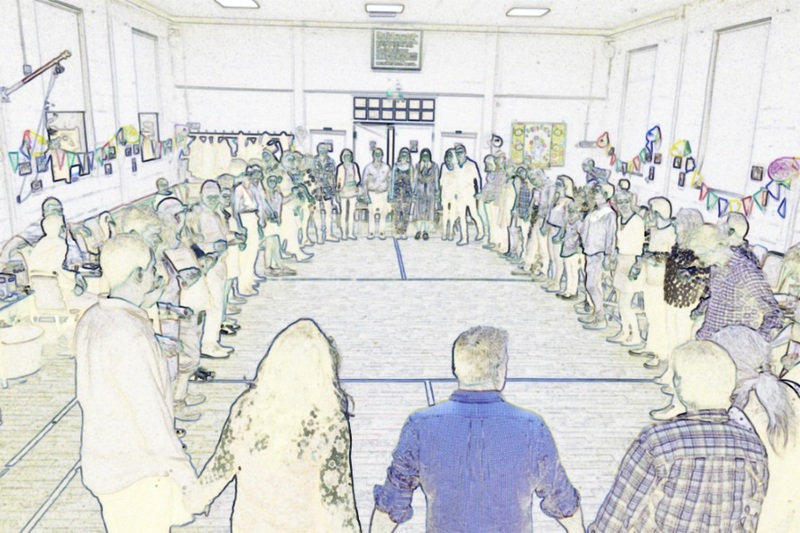 It was good to see different communities sharing the day…let’s hope the whole idea can spread into our every day lives! It has been a great pleasure to be on the BFF committee-have met some wonderful people…likewise it was good to meet up with old friends on Sunday and meet new people too. Thanks for the offer to play next year…we would love you to come!! 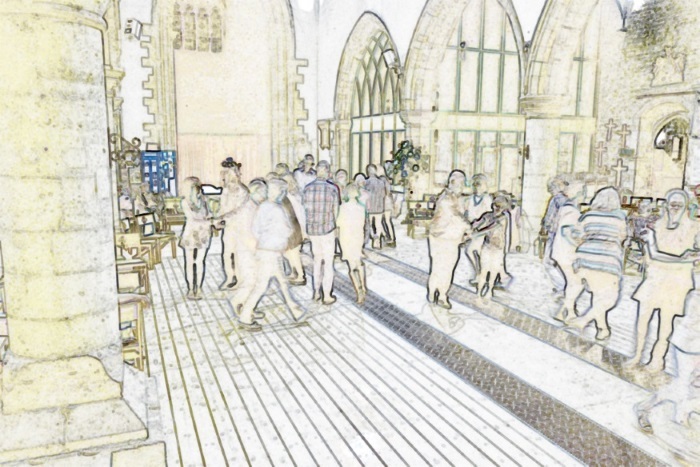 Gospel Bell were delighted to be welcomed back to St Leonard’s Banbury for a joyful Saturday evening social event and fund-raiser. On Sunday 29 April we were delighted to participate in an afternoon celebration service at St Mary Magdalene, Wardington. 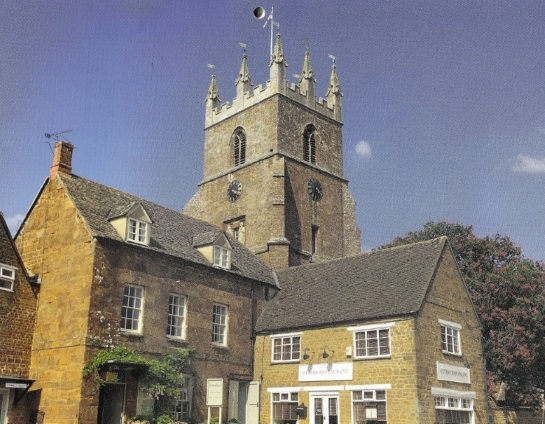 It’s the first time that we have played in this lovely old church – the earliest parts of which date from the 12th century. The chancel is particularly interesting because there is evidence that a church existed in Wardington by the year 1150. 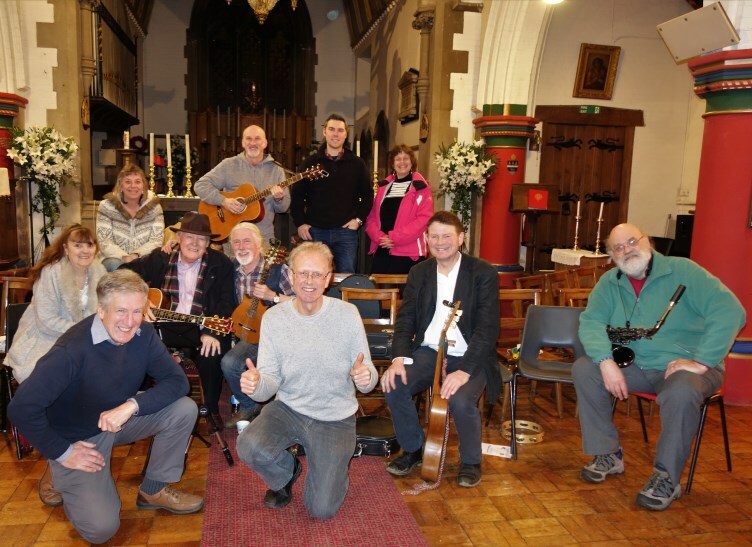 The band are pictured below with Shires Edge benefice Vicar Hilary Campbell, and we are looking forward to singing with Hilary and other members of the Gospel Edge singing group at future events. The Silver Bough Ceilidh Band played at the Mid-Worcestershire Labour Party fund-raising event on Saturday 21 April. The event was conceived as a celebration of 100 years of women’s suffrage and the Club room had been beautifully decorated in the suffragette colours of purple and green. 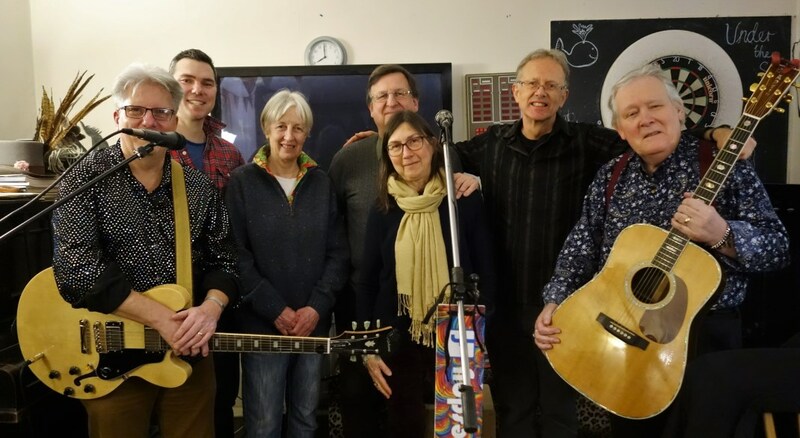 Those attending enjoyed an evening of dancing and reflection on the history of this cause and the Band were augmented by Donald’s friend Glen (guitar and vocals) and a theatrical percussionist who enjoyed playing along with us! Decorated in purple and green, the Evesham Rowing Club bar and lounge looked great! The Silver Bough Ceilidh Band played at a joyful twin celebration event – 25th wedding anniversary and 50th birthday on 14 April. The event was held in the Memorial Hall, Bishop’s Itchington, Warwickshire and the hall was packed with people who danced until late! 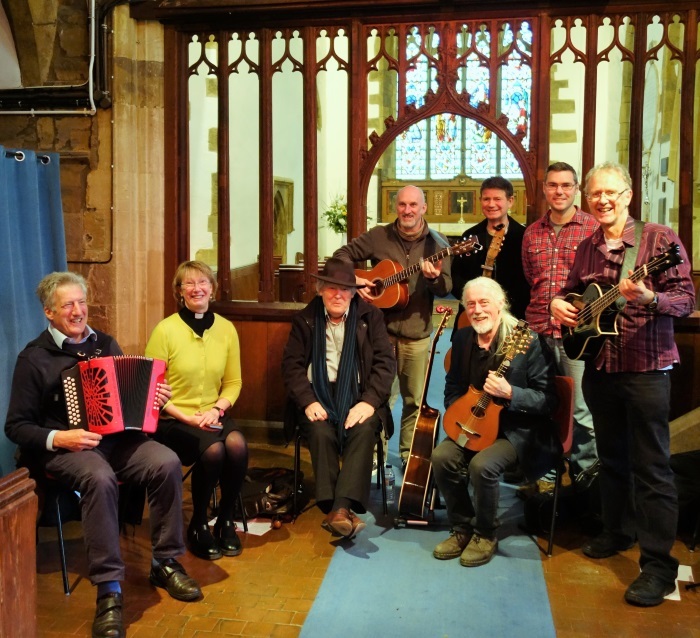 The Silver Bough Ceilidh Band helped to raise £800 for Oxfordshire-based Medic Assist International (MAI) at an all-age Barn Dance hosted by the Church of St Peter and St Paul, Deddington in support of MAI’s work in Embo, South Africa on 13 April. 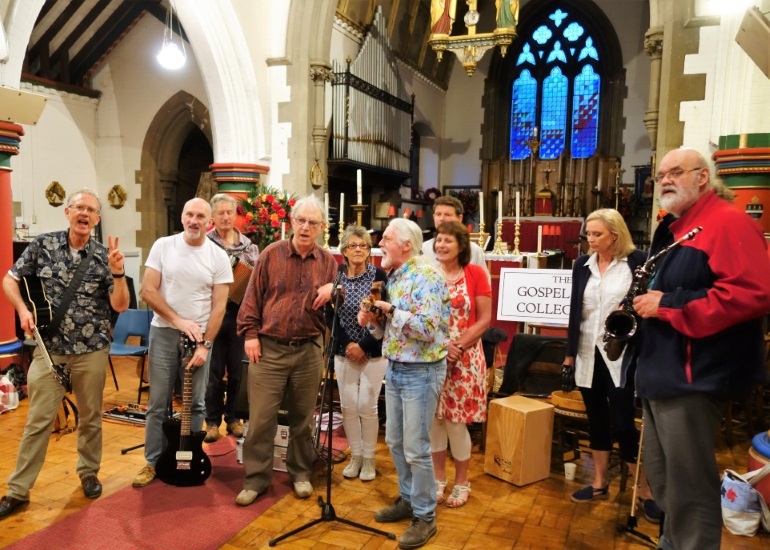 Members of Gospel Bell help to facilitate a quarterly popular music revival night ‘Groovy Tuesday’, hosted at the Bell, Adderbury, Oxfordshire. Who invented rock and roll? It’s hard to be sure but it could have been Sean (pictured below with his precious Martin guitar) – he even knows all the obscure songs from the 1950s onwards. 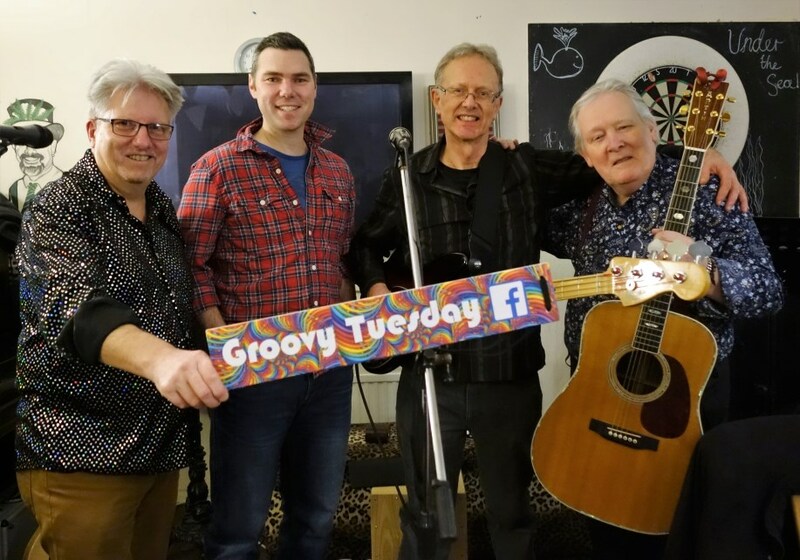 This is the ‘Groovy Tuesday’ house band: Sean and David (pictured left holding the sign board) sing and play their hearts out, David on rock, pop and blues guitar and Troy and Richard (pictured in the middle) make up the rhythm section. Last night we played: Dire Straits, the Eagles, ZZ Top, the Small Faces and old classics like ‘In the midnight hour’ ‘634-5789’(Wilson Pickett) and ‘Bonie Moronie’ (who remembers Larry Williams?). Great fun playing songs from 50 years ago (and more) and our repertoire is now big enough for us to play for about a week – non-stop! 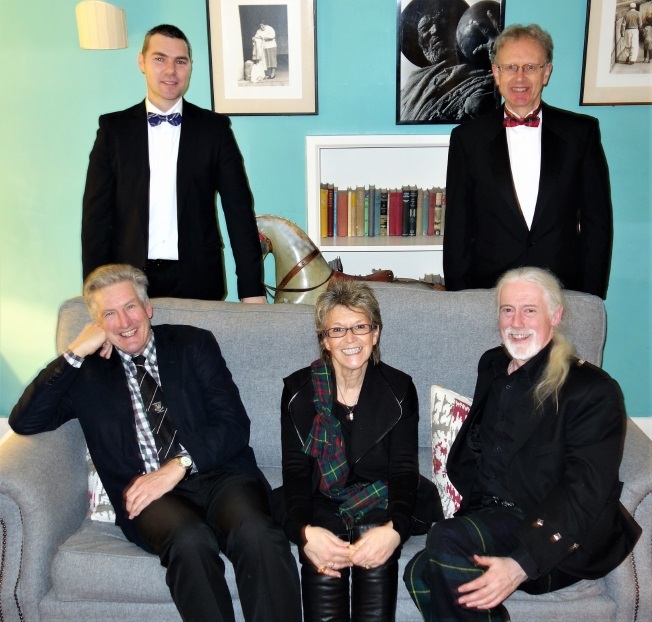 The Silver Bough Ceilidh Band led by Donald and Jackie provided the poetry, music and dancing for Burns Night at historic Talton House on Friday evening, 26 January 2018. 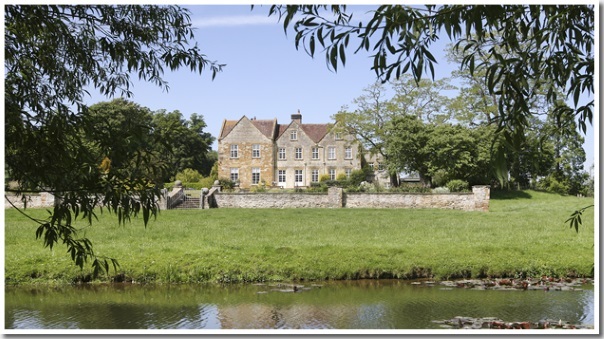 Talton House is a Queen Anne period building with history and charm. The bedrooms are named after family members, including ‘Dr Watson’ who was Queen Victoria’s doctor. For all its atmospheric high ceilings it has a fun, relaxing vibe and it sleeps up to 23 and hosts events for around 60 people. A full house enjoyed a memorable evening, with bagpipes, haggis, old Scottish poetry and Ceilidh dancing in the large hall from early until late! It was a joyful evening with enthusiastic dancing and music led and performed by the impeccably dressed Silver Bough. In the photo below, we are relaxing in the ‘green room’ prior to all the revelry. Our thanks to Olivia and Barney for hosting the event and for looking after us so well. With Donald McCombie, poet, storyteller, singer, musician, song writer. If there isn’t – as yet – a genre of music called ‘Gospel Disco’, Gospel Bell may have just invented it! 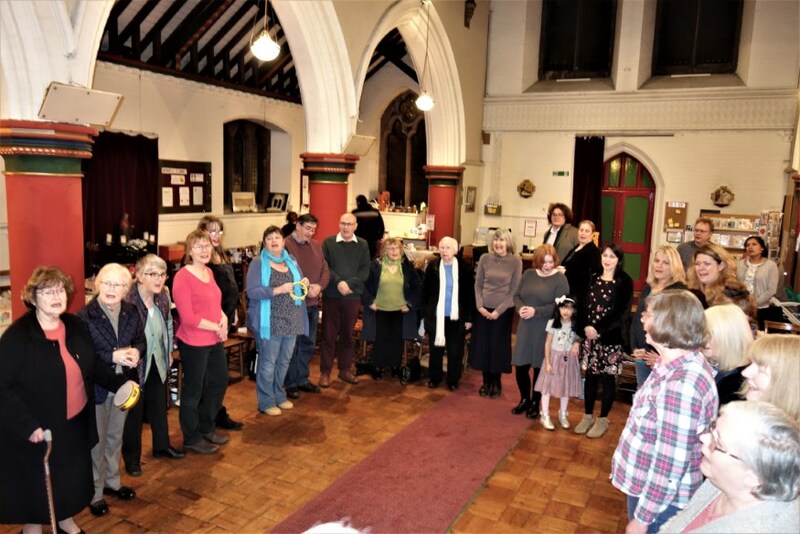 We were delighted to facilitate the singing and tremendous all-age dancing at a fund-raising event held at St Leonard’s, Banbury on Saturday evening 20 January. 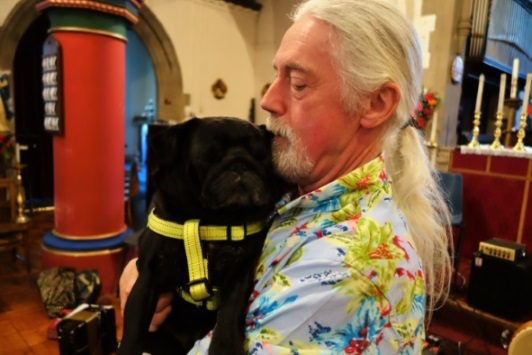 It’s the first time that we have played at an event in aid of the construction of a new toilet and we’re delighted that more than £200 was raised during the course of the evening. For the band, it was a really encouraging night as a ‘party’ atmosphere prevailed. 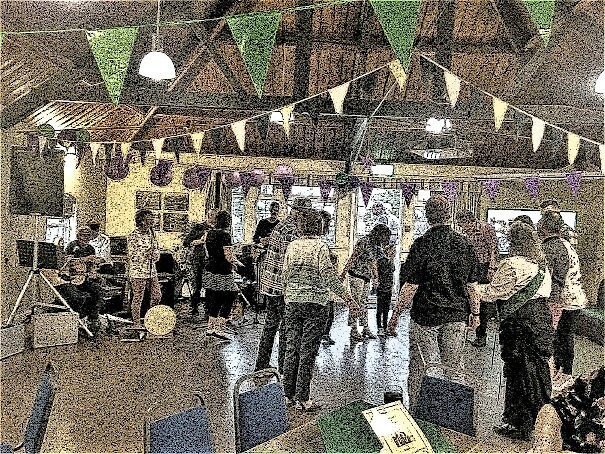 After an opening set of 30 minutes and a pause for a delicious buffet meal, the event moved-up a gear as almost everyone took a turn on the dance floor – including a few older people with walking sticks and other mobility aids. All the photos we took of the dancing are blurred because there was so much movement! Gospel Bell – music and dance band! It was encouraging to receive the following feedback comment: ‘Everyone at St Leonard’s was buzzing on Sunday morning, with those who went, telling those who didn’t what a great time they’d missed and saying “Can Gospel Bell come again please?”‘ Our thanks to Sue Ayliff, event organizer, Sue Burchell, vicar of St Leonard’s and to all who helped to make the event so enjoyable. We’re already looking forward to next time!